Assam Chief Minister Sarbananda Sonowal said his government will provide special assistance to flood-hit Hailakandi , Karimganj and Cachar districts of the Barak Valley for damaged infrastructure and rehabilitation of the affected people. Reviewing a high level meeting on flood relief and rehabilitation at Deputy Commissioner’s conference hall late evening on Saturday soon after his arrival from flood affected Karimganj district, Chief Minister Sonowal asked the Deputy Commissioner and heads of concerned departments to make a detailed assessment of the degree of damages and to submit reports to the government fot necessary assistance. The Chief Minister pinpointed departments like health, education, pwd, agriculture, water resources, public health engineering, veterinary and animal husbandry and power to submit assessment report of the extent of damages once the flood water recedes. 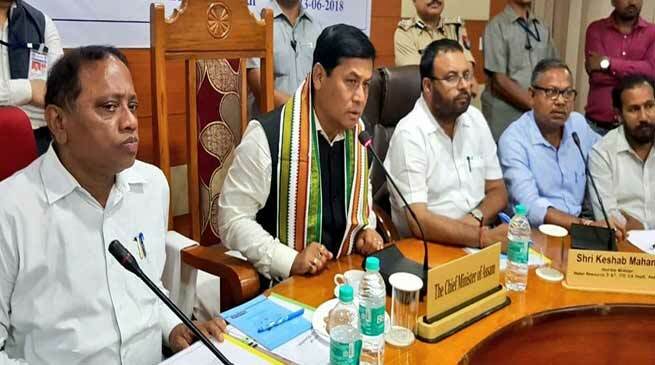 “A correct picture of the extent of damages to infrastructure like roads, schools and other buildings, embankment breaches, losses suffered by farmers, livestock affected and others must emerge of the unprecedented deluge that hit Hailakandi district,” said Sonowal. Terming his government ‘pro-poor’, the Chief Minister said the farmers whose agricultural lands were submerged by flood waters and those who lost their livestock, big or small, and other marginalised sections hit by floods must be compensated under different schemes. In this context, Sonowal made a clarion call to the Deputy Commissioner and heads of concerned departments to reach out to the flood affected people and to mitigate their hardships. “The people of the Barak Valley are in a state of shock because of the unprecedented deluge and they are in anxiety thinking as to what would happen to them as the monsoons would continue in the next three months. We have to visit the affected towns and villages to in still the confidence that we are with them at the time of crisis and will do everything possible to come to their aid,” he quipped. Viewing seriously that seven breaches occurred due to cutting in embankments, Sonowal said, “Awareness must be created by the district administration and water resources among the people that they should not resort to such practices as cutting in embankments to get temporary respite as their brethren downstream would be severely impacted by flood waters and they too would have to suffer the consequences in future.” Of the 13 breaches, six occurred due to sudden increase in water levels and the rest to man-made factors. In the same breathe, the Chief Minister asked the Deputy Commissioner to make an assessment of the number of defunct sluice gates along with estimate for releasing of necessary funds. “The sluice gates must be made functional or else people’s faith will be eroded. They will not go in for cutting off embankments as it happened here, once the sluice gates are made functional,” he added. Minister Parimal Suklabaidya who was present pointed out that the woes of the people could have been lessened had the sluice gates in the three districts being functional. Of over defunct 500 sluice gates in the Barak Valley, 242 alone are in Hailakandi district. The Chief Minister advocated the need to adopt best practices and modern technological interventions to tackle the twin problems of floods and erosion that plague the state every year. In the same vein Sonowal urged the state water resources department to tie up with the Governments of Mizoram, Arunchal Pradesh and Meghalaya for a comprehensive study of the flood situation during winter to gauge the impact thus enabling to formulate a master plan to combat the situation. Appreciating the good work by the administration during the deluge, Sonowal said, “I congratulate the Deputy Commissioner and the entire team for the good work you all have done during the floods. However, you should not rest on the laurels but continue the good work. You should make all-out preparedness taking into account the many lessons learnt from the recent deluge to tackle any exigency in the days ahead, as three months are still to go before the rainy season gets over. We will extend all possible support and cooperation,” he quipped. Sonowal asked the district administration abd health authorities to take all possible measures to prevent diseases outbreak and epidemics through proper spraying, bleaching, fogging and other measures, besides timely medical care and treatment to the flood-hit people by organising camps in the affected areas. 71 medical teams have been deployed in the flood affected areas. The Chief Minister assured that required funds would be released for revamping the old piped water supply scheme in Hailakandi town. Sonowal directed the Executive Engineer, PHE, Hailakandi division, AN Choudhury to engage a consultancy firm for the purpose and to submit detailed project report at the earliest. Earlier, Deputy Commissioner Adil Khan while giiving a power point presentation said there was an abrupt rise in water level of Dholeswari river on June 13 following flash floods in Mizoram. “Following heavy rainfall of 242 mm in Mizoram as per India Meteorological Department report, the water level of Dholeswari river drastically rose 10 meters above danger level and Katakhal river above eight meters. Such a flood situation occurred way back in 1989,” he said. Giving an overview of the extent of flood damages, Deputy Commissioner Khan said that the administration has been carrying out relief and rehabilitation in full swing. Dispur has already released Rs.50 lakh of the sanctioned Rs.1.70 crore for relief operation. Hailakandi is the worst affected district with 3.24 lakh people hit. 2,484.65 hectares of croplands have been destroyed affecting 41,747 firm families. Two persons lost their lives, while over 8,000 marooned people evacuated by SDRF and NDRF personnel. The review meeting was attended, among others, by Minister for Water Resources, Keshab Mahanta, Minister for Environment and Forests, Parimal Suklabaidya, Barak Valley Commissioner, Dr. Anwaruddin Choudhury, Principal Secretary, Revenue and Disaster Management, Rajesh Prasad, DIG, southern range, Debraj Upadhaya, MLAs Anwar Hussain Laskar, Nizamuddin Choudhury, Amar Chand Jain, Aminul Haque Laskar and Kishor Nath, SP, Mohneesh Mishra, Secretary, PWD, Chief Engineer, PWD, District Development Commissioner, FR Laskar, Additional Deputy Commissioners Amalendu Roy, Ruth Lienthang, EL Faihriem, CEO, Zilla Parishad, NKSK Singha, Circle Officers and heads of concerned departments. Deputy Commissioner Khan handed over a cheque for Rs.1.75 lakh contributed by the officials and employees of DC’s establishment towards the Chief Minister’s relief fund for the flood affected people.